This arrangement documented here will work with Windows 10 computers running the April Update (Build 1803) version of that operating system or newer versions. 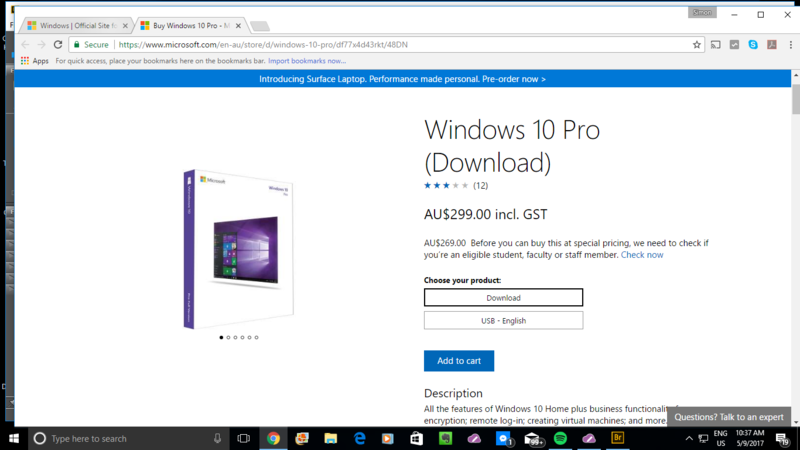 I have just applied the latest feature update to my Windows 10 installation on my regular computer and it has come across with a feature that most of you will want to benefit from when you use your computer to play audio or video content. 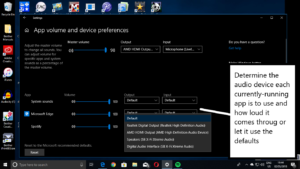 This feature update called Windows 10 April Update or formerly Windows 10 Spring Update (Build number 1803 in the System dialog) implements the ability to determine which sound device a program uses. Some Win32 (traditionally-developed) programs, namely well-bred media editing and management programs or VoIP programs have the ability for a user to determine which sound device they want that program to use. But the Web browsers, along with Spotify or TuneIn Radio and most of the Microsoft Store apps don’t offer this ability. This means that you could set things up so that the system sounds like that Windows error “ding” or the email alert sound don’t blast through the good sound system but play through the cheaper speaker setup like your laptop’s speakers. 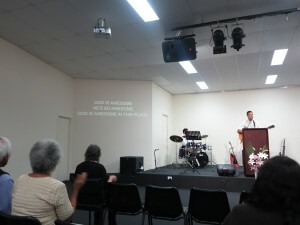 It is while Spotify or that other audio program plays through the good speakers or hi-fi system. 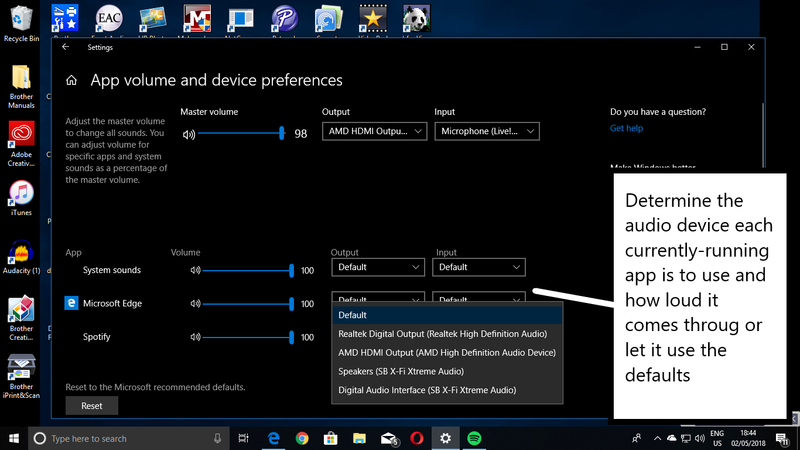 Similarly, you may want that YouTube video or the game you are playing to have its sound come through your big TV’s speaker but don’t like the idea of the Windows audio prompts being a distraction by barging through those speakers. play before you have it playing through the main speakers. 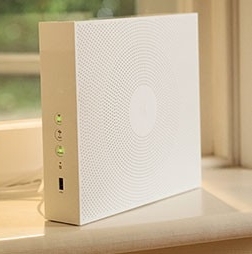 You would need to make sure that your computer is running with another sound device that is attached to the good sound system. 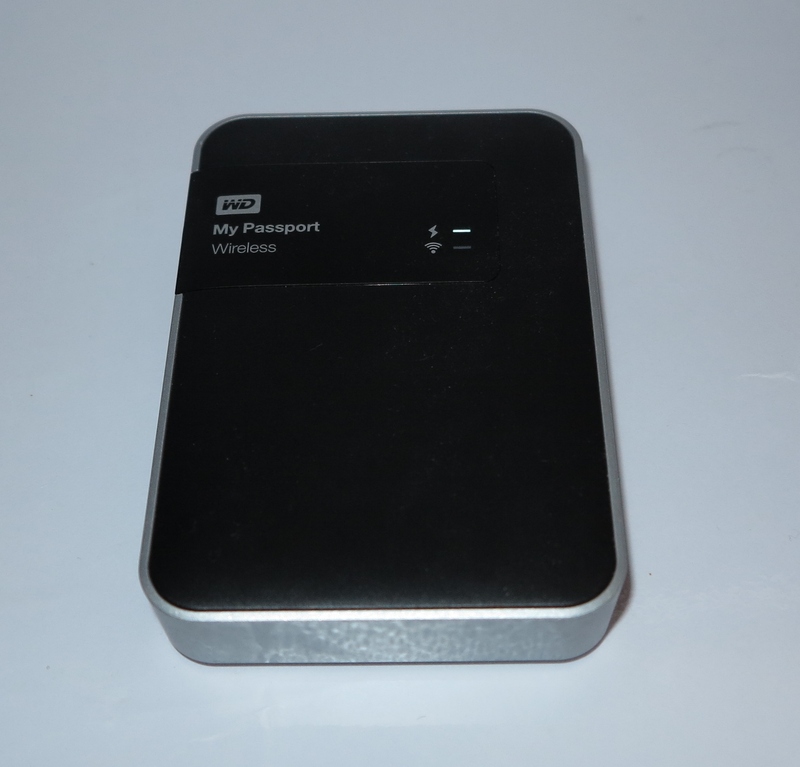 This could be a separate sound card, USB sound module or DAC, or a Bluetooth audio adaptor. 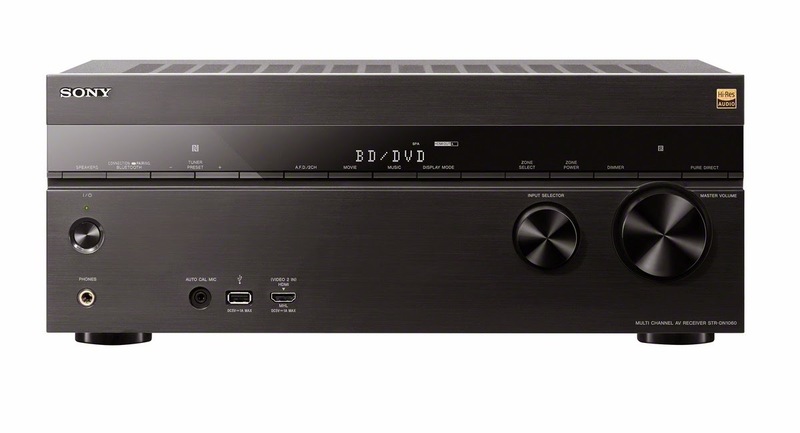 If you have the computer connected to a sound system equipped with Bluetooth, USB or similar audio functionality, you have effectively set up the secondary sound device. It also applies if you have connected it to the big TV or home-theatre setup using an HDMI cable. Then you identify the two different sound devices – the one that you want as your “primary” device for monitoring audio prompts that Windows provides and the “secondary” one you want your multimedia content to play through. The sound functionality that is built in to a laptop computer or a desktop computer’s motherboard will typically be represented by something like a Realtek, Intel HD Audio or similar chipset name. In most cases, this integrated-sound chipset serve the internal speakers in a laptop or a pair of cheap computer speakers connected to the audio sockets on a desktop computer’s motherboard. Display setups connected to your computer via HDMI or DisplayPort that have audio abilities will have those abilities seen as an audio function of the display infrastructure. Some of these cases like Intel integrated graphics chips will properly refer to the arrangement as “display audio” or “HDMI display audio” due to the function being separate from the computer’s main sound chipset. This arrangement also holds true if you are connecting HDMI audio devices like soundbars, HDMI audio adaptors and home-theatre receivers between your computer and your display using the HDMI cable. Let’s not forget that USB or Bluetooth devices that use the Windows audio-device class drivers will still identify themselves by their device or chipset make and model. This is to avoid confusion that can exist if you connect multiple USB or Bluetooth audio devices to the same host computer. Go to Settings (the gear icon in your Start menu) and click on the System option. Then click on the Sound menu on the left of the System menu page. Make sure the current sound device is the primary one that will drive your laptop, monitor or other cheaper speakers. Then click on “App volume and device preferences” to bring up the menu to determine which speakers Spotify or your other multimedia app will use. 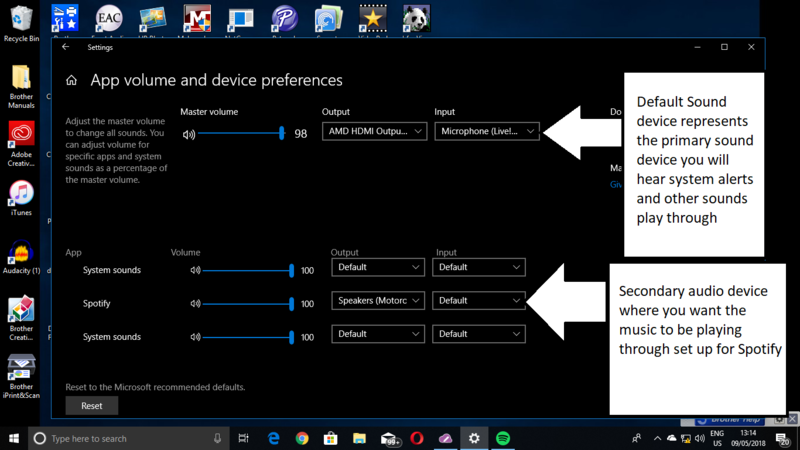 If you added a new audio output device to your computer, Windows will automatically assume it is the default audio device. Here, if you want this device to be the secondary device, you would have to use the above-mentioned Settings – Sound panel to select the primary sound device to be the default device. 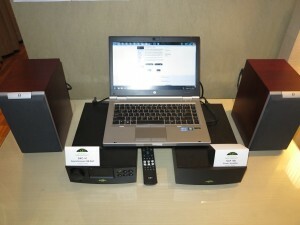 In my setup, I used my LG monitor which has an HDMI link and built-in speakers but yields laptop-quality sound as the primary sound device while a Motorola Bluetooth audio adaptor connected to an older boombox serves as the secondary sound device. Because I am using a traditional desktop PC, the Bluetooth link is facilitated through a USB Bluetooth modem. Next to the app you wish to direct the sound output for, click on the drop-down box in the Output column. At the moment, this will say “Default”, but use this to select the output device you want to have the app come through such as the USB DAC or Bluetooth speaker. 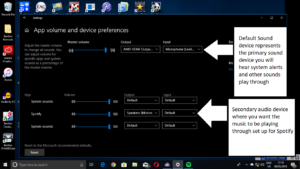 Here, I tested the setup with a Win32 app in the form of the Windows Media Player and it does work properly even though that program provides the ability for users to determine the sound output device that they use. Then I tried it with a UWP (Microsoft Store) app in the form of Spotify’s Windows 10 port and this worked reliably. Subsequently, I also found that this setup worked with Google Chrome when playing a YouTube video. Through these tests, I made sure that the Windows sounds were playing through the primary speakers. You may have to run totally different browsers if you want the sound from one Webpage to pass through one device while the sound from another Webpage passes through another. This can be of concern if, for example, you are running a YouTube playlist or something similar as background music while you are playing a Web-based social-media game. To get back to your normal settings, click the “Reset” button in the “App volume and device preferences” window to have all the sound sources work through your default devices. 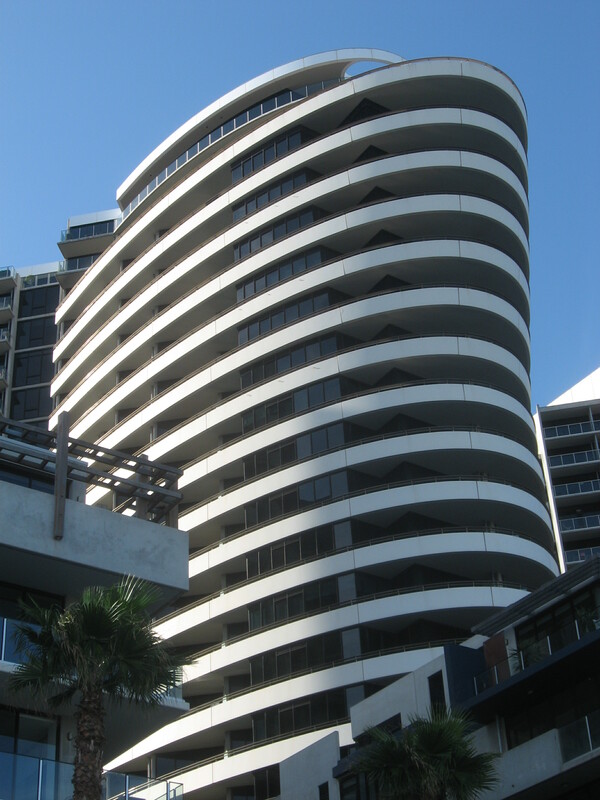 You may find that some media content may stop if you switch audio devices while it is running. If you do use this ability to maintain a “cue” device and a “main” or “front-of-house” device for playout purposes, you will have to pause the media file before you switch audio devices or simply restart the media content after you switch. There is the ability to determine which input device an app uses which can be good for Web-based, Microsoft Store or similar apps that don’t provide an option for you to choose which microphone device you are to use. This can come in handy if you want to use a more accurate microphone with Cortana, courseware apps or baseline notetaking apps rather than your 2-in-1’s built-in microphone. In this case, you choose the Input device you want to use for each program or Web browser rather than choosing the Output device. This feature could be taken further through the use of a “Default Multimedia Audio Device” definition that is expressly used for media-player software and/or a “Default Game Audio Device” definition used for games.This could then allow a user to have an audio device work as the one to use for multimedia or gaming purposes while another is used for the system sounds. 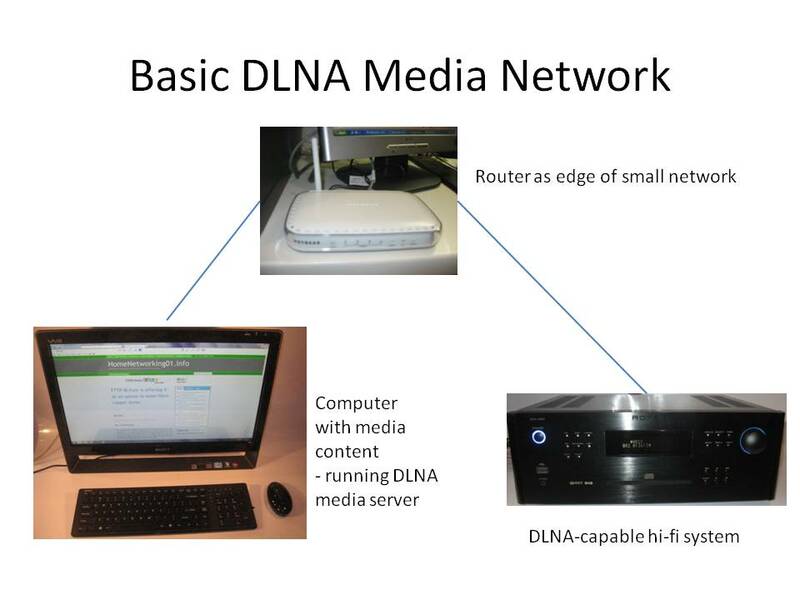 It can then lead to the ability to create an “audio device ladder” for each audio device class where connection of certain audio devices like headphones, HDMI-equipped TVs or USB DACs overrides other audio devices in a particular order. Another issue that will crop up with this new ability that Windows 10 April Update provides is sending different audio content to different “jacks” served by the same audio infrastructure. 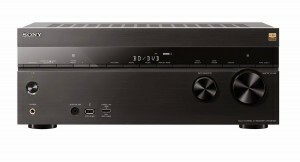 It may come about through cheaper computer designs that only have one audio chipset for HDMI, internal-speaker and audio-jack output rather than allowing for a separate audio function that is part of a graphics infrastructure to support HDMI digital audio. Now you are able to make sure that your Windows computer’s multimedia software can play through the speakers that would suit it best without having the various audio prompts that the Windows shell or office software creates blasting their way through those speakers.